LEE Filters has introduced a "next-generation" filter system, the LEE100. The LEE100 is based around a new glass-filled nylon holder, which arrives with a 16% reduction in weight over its predecessor. 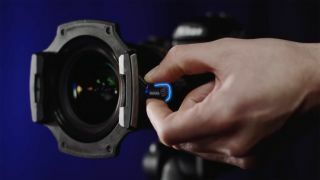 It attaches to the adaptor ring in the same way as previous versions, and can be secured with a new blue locking ring that can be set to three different positions: neutral, half lock and full lock. Neutral allows for the filter to be removed and rotated, while half lock allows for rotation but not removal. The full lock position, meanwhile, prevents the mounted filter from being removed or rotated. Fully compatible with the company's existing 100mm filters and adaptor rings, the holder differs from its predecessor in that it's based around a modular design with new filter-holding blocks. Supplied with the holder as standard, these blocks have a tapered profile to hold the filters securely, and accept one, two or three filters at a time, with the promise of no vignetting even when three filters are used at once. The new kit is also compatible with the newly announced LEE100 Polariser, although users of the existing LEE 105mm Polariser can also use this in conjunction with the new holder via a clip-on ring. The kit comprises a LEE 100 holder, three filter guide blocks, a tool used to remove and replace the blocks and a pouch to store all components. The holder is now available for £83 in the UK and $96 in the US, although Landscape, Long Exposure and Deluxe kits comprising the holder system and appropriate filters can also be ordered, priced at £168 / $192, £358 / $409 and £648 / $739 respectively. Pricing for Australia for has not yet been confirmed. You can learn more about the new system at Lee's dedicated microsite.